He has a Trader Joe's Apple/Carrot crusher, some yogurt covered raisins, animal crackers that were not animals but letters/numbers, and a puzzle shaped cheese and mustard sandwich. I found the puzzle sandwich cutter in Walmart, in the baby section - next to the sippy cups. They are new from Munchkin, and there were other designs as well. Cute, huh? You find the best food gadgets! I love the puzzle sandwich! The puzzle sandwich is fantastic. What a fun idea. Looks like a great lunch to me. That puzzle sandwich is cool. My middle son officially gave up sandwiches. We send fruit and veggies and dip now instead. Very cute sandwich. My neighbor's little great granddaughter would love this! That is cute Lisa! I will have to look for the puzzle cookie cutter because that would be a big hit at my house too! Do you think my soon to the high school daughter would want to have her lunch to look like that? lol I know my 8 year old would love it. Oh, that puzzle cutter is just da bomb! Made the bread so cute that anyone would want to eat it. Fun!! I love the puzzle sandwich--so creative and fun! The rest of the lunch looks quite good. I like cheese and mustard together too. . . . 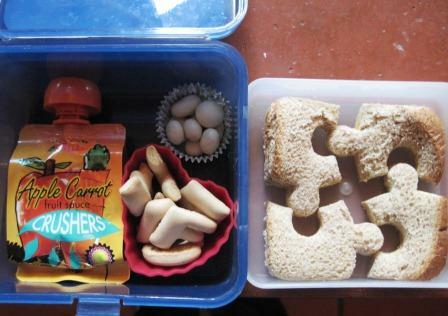 I love the puzzle sandwich too-and the letter and number animal crackers. Amy is so tired of making her lunch she's been buying it more often. Luckily-she makes pretty good choices in the cafeteria in spite of what kids can buy. Every child would love that puzzle sandwich. So neat! as a big fan of picture puzzles, i'm lovin' the sandwich! Love the Puzzling Lunch, Lisa.... That's neat---finding a puzzle sandwich cutter.... Love it!!! How cute is that puzzle? I'll have to look for it for Hunter; she'll love it! I love the puzzle sandwich! The puzzle shapes are just the cutest! I love the puzzle sandwich! Too cute! Oh! I need to run out and get a puzzle sandwich cutter right this minute. That's so cute! Ohhhh.... I NEED puzzle shaped cookie cutters. Love that luncb! How lucky your Pierce is to have such an inventive Mum to prepare his lunches...looks better than school fare for sure! Still recovering from surgery, so not as active lately, but taking this hour to post and visit friends...glad I did! This is worth sharing if you don't mind! What a fun lunch. I love that idea. I bet it is getting hard to think of new things. You have done so many creative lunches that ... what is left? Oh I have this overwhelming urge to make one of these just so I can smoosh the puzzle pieces together. You bring out the kid in all of us I think. haha, great title and a super fun lunch!! Too cute- my grands would love it. I love the puzzle sandwich cutter. How cool!